Yesterday, I decided to go diving in the morning and found that the dive schedules were: diving in the North of Komodo Island! Yeayyyy!!! 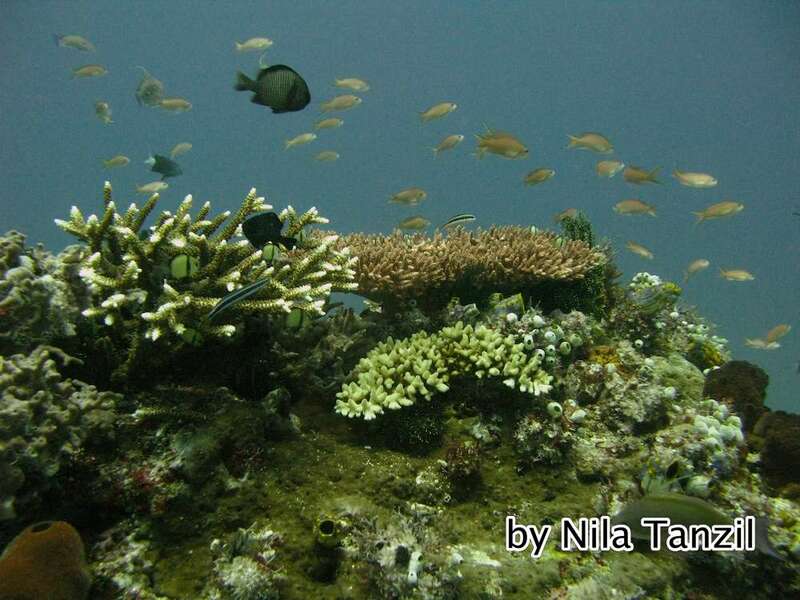 The Northern part of Komodo Island is my favorite dive place. 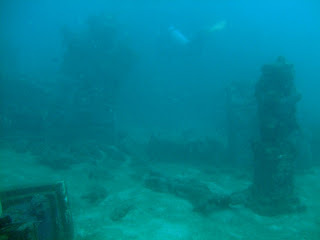 Some of the gorgeous dive sites in this side are Castle Rock, Crystal Rock and The Quadrant. Each dive site has its own uniqueness. Castle Rock is always full of schools of fish, from groupers, jack fish, etc. Diving here is always mind blowing. This site has never let me down :). 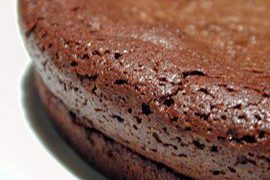 Try it yourself, then you’ll see what I’m talking about ;). Crystal Rock always amazed me with its gorgeous corals. Every time I dive here, I feel like being in a big colorful garden. The beauty of its corals has made this site a beautiful underwater garden. Full of color with different types of species living in it. Sometimes I smile (can you smile when you’re underwater? of course!) and take a deep breath, when I think that all of these beauty is actually belong to my country, Indonesia. It makes me proud of being Indonesian. It always reminds me how rich my country is, in terms of natural resources. Yet, what have we done to preserve and protect it? I LOVE Komodo National Park and I don’t want to see it destroyed. And this would only happen if all of us, especially Indonesians, do something together to protect and conserve it. Some people say, that’s how things work with nature. Especially when human beings already interfere with the nature. How sad is that??? I believe when all of us do something to protect our natural resources, it would make a big difference on this planet. And the effort has to start from ourselves… today. Anyway, back to the dive at the Quadrant. As soon as we went up to the surface, the boat crew screamed, “Come up to the boat, quickly!! We saw 2 big whales swimming around!” WOW!!! So, if scuba-divers got excited ‘only’ by seeing sharks, could you imagine how excited we were when we saw whales??? It’s like a dream of every single diver on earth to see whales. Be it sperm whale, orca, and… blue whales! And, apparently, it was my lucky day. 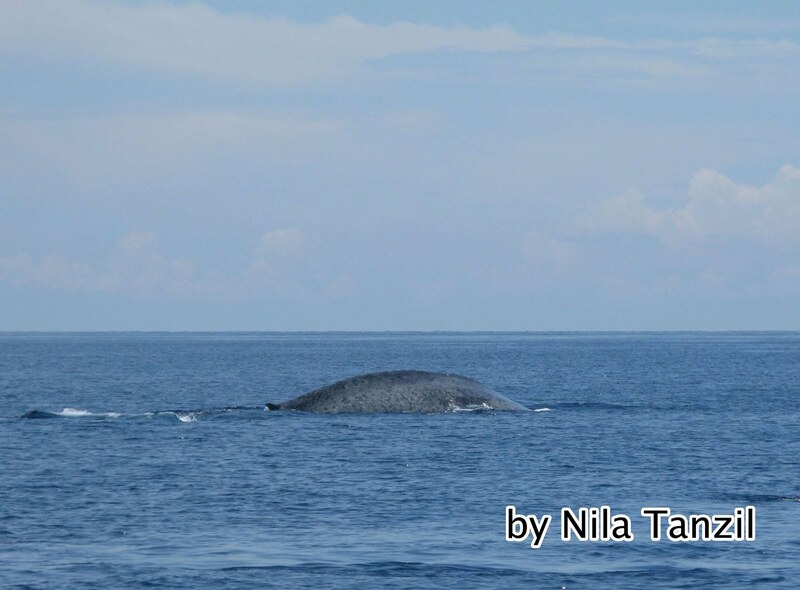 I saw 2 pair of BLUE WHALES swimming and jumping around about 50 meters from our boat! WOOOHOOOOO!!!!! OH MY GOD! All of us on the boat were so excited. We tried to come near them, but they’re much faster than us. We tried to follow them, but I guess they didn’t want to be near us. The blue whales always swam away… sometimes they disappeared and then popped out again in a totally different direction and far out from our boat. Smart whales they were!!! What is blue whale? Blue whale is actually a marine mamal. It’s the biggest living creature on this planet. The size can be as big as 33 meters in length and 180 metric tons or more in weight! 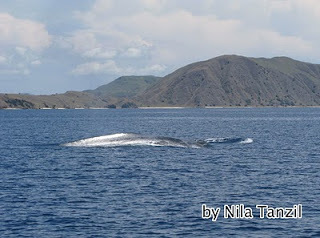 As for its speed, blue whales can reach speeds of 50 kilometers/hour. No wonder we couldn’t keep up with them! In the past 40 years, blue whales were hunted almost to extinction by whalers until protected by the international community in 1966. 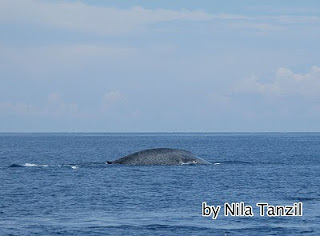 A 2002 report estimated there were 5,000 – 12,000 blue whales worldwide. The IUCN Red List has put blue whales in its “endangered” list. Apart from hunting, blue whales face threats from orcas. Although the orcas are usually unable to kill the blue whales rightaway, but the whales will suffer from the massive wounds and probably died afterwards. A scientist mentioned that usually blue whales sightings will be followed by orcas sightings. At first, I didn’t understand why? But the above info has explained it well. 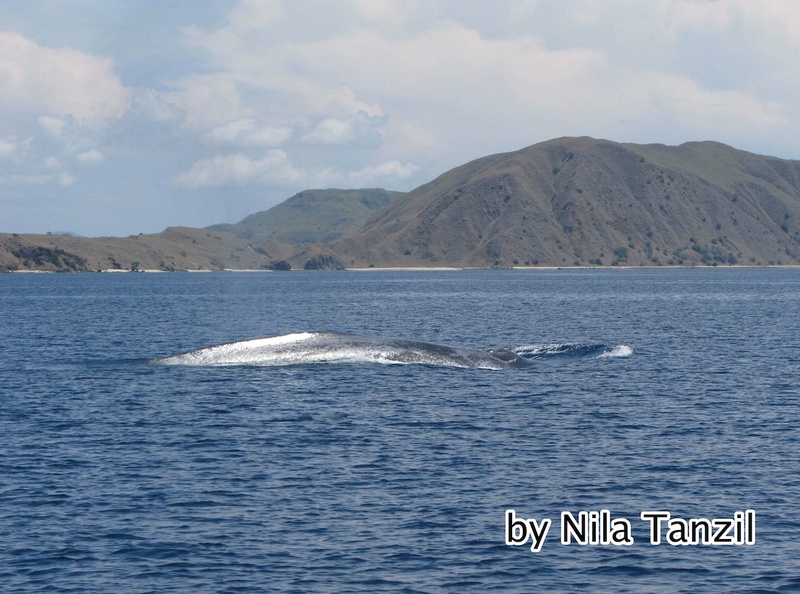 And guess what, the day after we saw the blue whales, a group of divers saw an orca in Komodo National Park! My friend even swam with it!!! Wow! Too bad I didn’t go out diving on that day…. arrrggghhh!!! Another threat that blue whale might be facing is the global warming. Considering the blue whales migration are based on ocean temperature, changes in this circulation, which moves warm and cold water around the world, would be likely to have an impact in their migration. And the change in ocean temperature would also effect the blue whales’ food supply. Next articleKomodo Dragons’ Lunch Time!